At the Chad Johansen Golf Academy our #1 Goal is to instill a love of golf with your child. We do this by creating a learning environment that is a fun, safe and interactive. Juniors golfers learn the game with their peers and make new friends, while learning valuable life skills and core values inherent to the game. In every session, Junior Coaching students develop skills, tackle challenges and participate in fun competitions, all designed to make learning the game of golf fun and effective. We coach golf in a way that makes playing the game fun, and in doing so we ignite a passion for golf in your child. Junior golfers from Aurora, Oswego, Naperville and throughout Kane County have found success with this unique Junior Coaching Program. 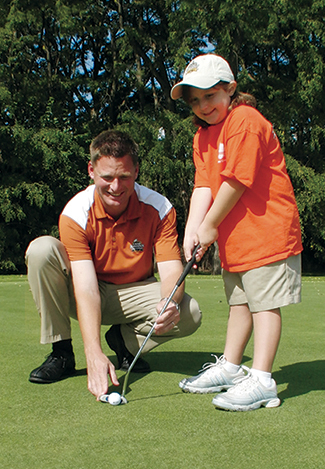 Junior Coaching is a year-round program, and your child can start at any time. The junior coaching programs meet weekly at Blackberry Oaks Golf Course in Bristol. The programs are based on age: Wee Swingers (5-9), Par Players (9-12), and High School Players (13+) are placed on teams according to their skill level and experience. Participants don’t need golf clubs to start, but as they start to enjoy the game we will suggest the clubs that fit them best and best places to purchase them. The advantage to the Junior Coaching Program is the ability to start at any time. If you are interested in learning more, please fill out the Junior Coaching contact form (below) and Chad will follow up with you.